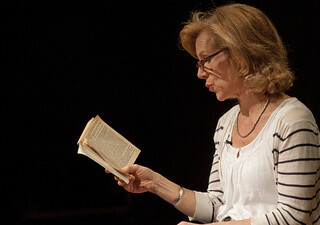 Actress Juliet Stevenson reading a passage from Virginia Woolf's Mrs Dalloway at the High Tide festival in Suffolk. The reading was part of a Q&A with Will Gompertz. As you can see the paperback doesn't look marked up, did she prep it? Don't know but it was a beautiful reading.